As 2018 comes to a close, it’s time to remember all of the highlights of the past year and look forward to 2019! Have a Night Out - If you are a fan of a night out, you can celebrate by going out on the town. Enjoy dinners, drinks, and dancing while you count down to the New Year! Watch the Ball Drop – On New Year's Eve, the famous countdown occurs in New York City's Time Square. In fact, many other cities around the world have big celebrations to ring in the New Year as well. You can choose to go to the celebrations or watch them on television. It’s a tradition that many people really love. Have a Big Dinner – Many people choose to celebrate the New Year by treating themselves to a big, delicious meal. Restaurants often have course menus that make your celebration extra special. Celebrating Chinese New Year – This year, the Chinese New Year is going to be celebrated on Tuesday, February 5th of 2019. You might have also heard it referred to as the Lunar New Year. While they are separate, they occur at the same time of the year making them intertwined. The Chinese New Year is related to the phases of the moon, which explains its relation to the Lunar New Year. Don’t worry if you’re too busy to celebrate on the 5th, the festival lasts about 23 days, so there is plenty of time! Your Family– Everyone in your family deserves a New Year’s greeting. Maybe they’re sitting next to you on the couch, or maybe they are somewhere across the world. Either way, an ecard will make them smile! Your Friends– Make someone’s day by sending them an ecard this New Year’s. Your friends will be happy that you thought of them and are sending them positive wishes for the upcoming year. Your Coworkers– They’ve helped you year in and year out, make sure to give thanks. Your coworkers deserve a happy greeting and a wish for a brilliant year ahead. It's also a great time to say thank you if they have gone above and beyond this year. Maybe they helped you with a specific project or really came through on managing a task. Let them know their efforts matter, and you look forward to an excellent 2019. 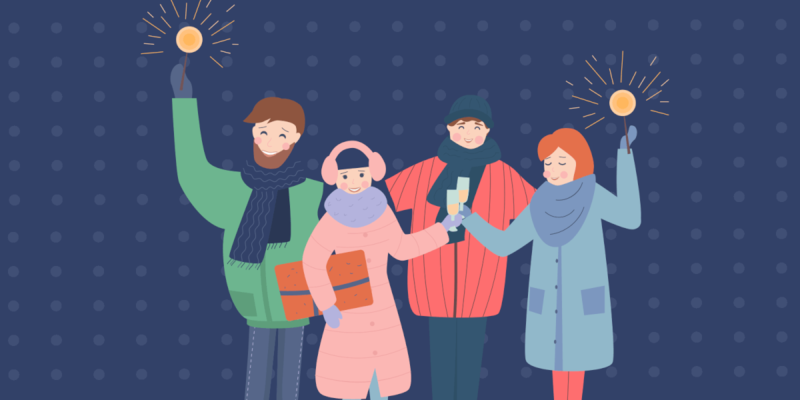 Your Neighbors– Whether you see your neighbors all of the time, or you share the occasional wave, sending a card is the neighborly thing to do. An ecard is a simple way to say “Hello!” and perhaps turn a neighbor into a friend. Wishing you and your family an outstanding year to come. Hoping you have a healthy and happy 2019! Looking forward to yet another wonderful year of friendship – here's to an incredible 2019! Cheers to a fantastic 2019! Can't wait to see what incredible things you'll achieve. Sending you love and joy, and wishing you a very happy year ahead.